WE ARE SO EXCITED! It’s Christmas Eve and it’s honestly the greatest time of the year! We love everything about the holidays! Think family and lots of cozy. To end this year out right, we are so grateful to partner with THE COMPANY STORE to share some super cozy bedding around the Christmas tree!! When we say cozy I mean the coziest bedding! The Company Store makes some incredible durable bedding. This duvet is heaven and it’s insulated with the comfiest down comforter. You can find the duvet HERE. We chose the LaCrosse® Down & LoftAIRE Dual Comforter to put inside the gorgeous duvet. It is super soft and feels like a big giant cloud! We honestly didn’t even feel like we were sleeping on the floor! It’s that amazing y’all. The coyote faux fur blanket is on clearance right now! We take it in almost every room. It’s super soft and just gorgeous. The color is perfect for cozy winter. These precious moments. Harper is all excited for Santa to come! These are memories we make every year and I so look forward to them. She loves having a sleepover by the Christmas tree!! I hope you all start doing this with your family! I think it would be fun to have a GIANT sleepover for the holidays!! Our green LaCrosse® Down and LoftAIRE Blanket / Throw is awesome!! The color is so good and it is super soft. We will be using it years to come! She asked Santa for LOL dolls and for her family to be happy. She said she has all she has ever wanted. Makes me cry. I am beyond grateful for her!! She doesn’t know it but we got her a big farmhouse dollhouse too!!! I can’t wait to see her face tomorrow morning!! This will be James Taylor’s first Christmas! We are all excited to spend it together. They are so precious. My heart is full and now we are adding more to the family!! It’s the BEST Christmas ever!! y’all know we are going to fight over this bedding, right?! I mean, I think we know who will win but gosh it’s the softest. We had the best time and want to thank The Company Store for partnering with us the Christmas Eve. They make the best home decor and are give back so much. It’s an honor to work with them. Have the Merriest Christmas & Happy Holidays!! Baking around Christmas time is one of our favorite things to do as a family! I am excited to share one of my favorite recipes, along with some other amazing bloggers & designers! It’s such an honor to share with them on this sweet Christmas Cookie Swap! We are baking Christmas Chocolate Chip and M&M Cookies! They are delicious and super easy to make. I created this graphic so you can save it to Pinterest for later! You can add white chocolate or dip them in chocolate. The possibilities are truly endless but this is your base! Feel free to throw in other toppings. We like to put them in bags and gift to our friends! The cookies come out soft and golden brown. Keep them in for a bit longer if you want them more crispy. I love adding M&M’s but we love to change it up too with sprinkles. I would love to hear what you think! You can send me your cookie selfies too. Harper and I look forward to seeing when you guys bake with us. Christmas is all about giving and these are sure to brighten anyone’s day! Maybe this is a sweet recipe you can carry on every Christmas and put your spin on it, too! These are easy to bake with your children to leave out for Santa! Unlike many homemade chocolate chip recipes, they don’t call for brown sugar. I think the brown sugar really makes this recipe. Enjoy! Have such a beautiful Christmas! Up next is my friend, Beth with @1111LightLane sharing her yummy Italian Drop Cookies! If you aren’t following Beth, you totally should! She is incredible creative and kind! I can’t wait to try her Grandmother’s recipe! Thank you for stopping by our farmhouse and we hope you love the cookies! Merry Christmas!! We finally made it to Disney World! After all these years, Harper and I saw the Disney castle in person! Talk about magic! Even with all the rain, it was magical. A lot of you all followed our instagram stories and watched all the fun we got into! The fireworks were our favorite. We shared a lot of our stay at Encore! That house is unreal! 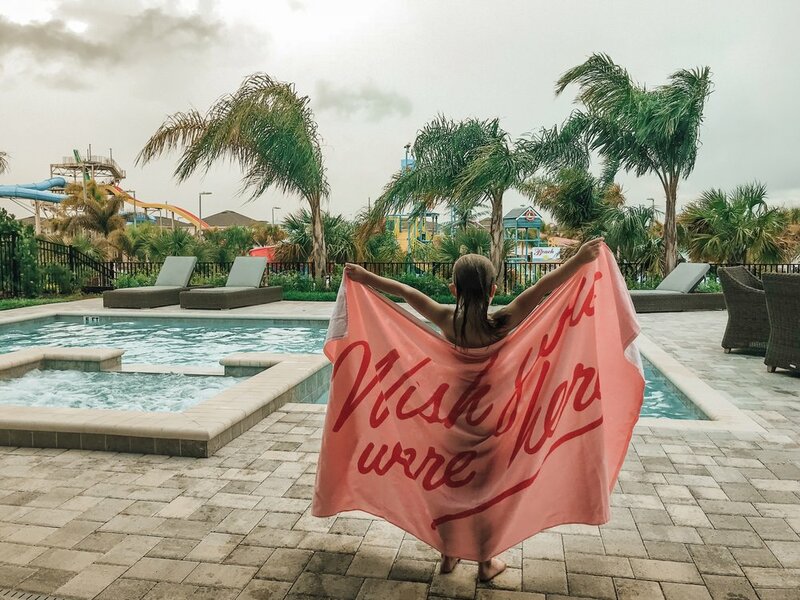 The pool alone is what dreams are made of ! Really, it was so nice to go outside and spend time at the pool. I would give Encore more than 5 stars if I could. This was my first ever stay at a vacation home! The experience was incredible. The place was decorated beautifully and the price is super affordable. We were able to take a shuttle or Uber to Disney and avoid a lot of lines and parking! That was really nice. The staff were super friendly. The pool at the resort is incredible. They have 3 huge water slides and one super scary one that I was afraid to get on! haha! The floor drops and then you shoot down the slide. It looked like a good time though. The cabanas are gorgeous and filled with fridges, television, couches...pretty much the dreamiest situation imaginable. We had a chef come and cook for us one night! Luckily, my parents were able to come in for a couple nights and got to eat with us too. They did an incredible job and the tacos were so good. The guacamole was delicious. If you come to Encore, I highly recommend scheduling a meal with the chef. It was an experience we will remember and appreciate forever. We had the time of our lives!! This is a trip we will remember forever! It was amazing. Honestly, we cannot wait to go back and this time take a larger group and stay! BIG thank you to Encore for letting us all stay with them. Thank you for stopping by. I would love to hear your favorite part about Disney in the comments. Have a fabulous day friends. We are getting ready for 2 big wedding showers at our farmhouse. I can't wait to break out my party pants! It is going to be so much fun. They will both be semi boho themed for2 of my best friends getting married! I have been in major planning mode. We are partnering with Thermacell today to share our BIG lifesaver for the parties coming up. We usually get covered in mosquitos. They used to be so bad around here. It was awful. I would sit on the swing and about 30 minutes later felt like I was getting eaten alive. Mosquitos love Harper and me! Thermacell came up with a pretty incredible idea to fight off mosquitos without a gross scent or smoky candles that don’t go with your decor. We’ve been using them for a while now and it’s been a lifesaver. Thermacell Patio Shield has a 15 foot radius and actually compliments any style of decor. They come in several colors! It's odor and deet free. It's cordless and portable so we can take it out in the field near our hammock. This one is my favorite color. It's super easy to use. You just insert a butane cartridge and repellent mat and it's good to go for hours! Let me know what you think! A lot of you have reached out to me on insta that you went out and bought some and love it. That really makes me happy. I love sharing awesome companies we believe in. Thermacell is offering you guys a 20% off discount using code SARAH20 in checkout! As for the parties, I hope to get some snaps before and share on my stories! It is going to be awesome. I have been thinking of hanging dream catchers in the trees out front and rustic doors lined up for photo booths! CHEERS to Summer and outdoor living!! Summer will be here in 14 days! Can you believe it? I can't! I feel like the days are flying by. Lately, I've been trying to set aside some time to slow down and just spend time with Harper. Our favorite place to spend time with each other is out here on the porch and front yard. We partnered with The Company Store to share some of our favorite outdoor pieces with yall! Decorating your front porch is so much easier than you can imagine. I am going to give you a few of my top tips! 3. Think Cozy. Blankets, layered sheets, anything soft and the right kind of music makes it even more cozy! Flowers are a nice touch! I also want to tell you about The Company Store's Get Set for the Summer Sweepstakes!! They are giving away a brand new full Palo Alto Collection! It is gorgeous! You can click HERE to ENTER! It really is an awesome giveaway. Here are the gorgeous pieces I picked from The Company Store to go with our porch! Orange is so in right now you guys! I love it! LOVE it!! The throw is heaven. I love how comfy everything turned out. The pillows are super comfy! Layering pillows make it so much more comfortable! You don't have to make it look perfect. See what warm lighting does to a space? It has made it super inviting. Thank you for stopping by our farmhouse and hanging out with us on our porch. I would love for you to share this with your friends that are wanting to decorate their porch too! Leave me any questions you may have in the comments! I would love to help you create that beautiful summer porch scene. BIG thank you to The Company Store for working with us on this post. Have a beautiful weekend! Hey friends! Mother’s Day is around the corner. Establishing a routine has always been hard for me. I partnered with The Company Store to talk about our routine. We are partnering with their campaign, Why is bedtime so special to you? One things for sure and that is my bedtime routine with Harper Grace! The world could be chaos and the house in huge disarray but Harper is guaranteed a good teeth brushing and a bedtime story! I remember all the nights my parents took the time to read to me and it was so important. It made me feel special. I want Harper to feel the same way. I want her to look back and see the love around her. We cuddled up with our favorite vintage book. It’s called My Goodnight Book and I read this same book as a child. We love it. There are several books we have read the past five years but this one is our favorite. On a perfect night, dinner is homemade and I run Harper’s bath afterwards. She plays while I clean up and then she washes her face and brushes her teeth. Sometimes I help her get ready for bed but a lot of the times Miss Independent wants to do it all herself! We then read a bedtime story and say our prayers. Other times we might be in a hurry but we still make time for brushing teeth, bedtime stories and sharing our gratitude! Speaking of gratitude, I love for us to say at least three things we are grateful for that day. This opens up other conversations and she can talk about anything that could be bothering her or whatever she feels like saying. I love her so much. Although, no bedtime routine is perfect. We are all doing our best as Mothers. Raising our littles is a big job. It's worth every minute though. Big thank you to The Company Store for partnering with us on this post and for creating gorgeous sustainable home decorations that I can share with my family. Hey friends. I have been so excited to share this post with you guys. It's all about getting back to the basics of bedding, sheets, pillows, comforters and more. There is so much more than just finding sheets and a comforter for your bed. We partnered with The Company Store on this blog post to share all their basic bedding choices. If you don't know The Company Store, they are owned by one of my favorite companies...Home Depot! Yes, can you believe it? It's amazing! You will have to check out their website and see everything they have, which is a lot! One of the things I love most about them is that they give back to the community, aside from their gorgeous bedding. They have helped so many people and organizations. It's truly inspiring. Let's talk basics! When it comes to bedding, I look for comfort, durability and texture. First, comfort. I chose the LoftAIRE Reversible Mattress Topper, which is super comfy. It gives your bed a good hug! Think fluffy cloud. If firm is more your thing, they have several firm mattress pads as well. I love this one most because it is reversible, so you can flip it! It's also a great down- alternative, hypoallergenic and provides allergy relief to those allergic to down! I love how fluffy it is. Second, durability. You want durability in bedding, bedding that lasts a long time! I believe you have met your match. The quality and durability is on point. I got the Comfort Wash Solid Linen Bedding! It is everything. I got white, and they are just yummy. One big thing about linen is it gets softer over time. Linen is timeless and very luxurious. This is my first linen bedding and I am really impressed. They make me happy! Comfy pillows are really important. These are super fluffy pillows, the kind that takes you far away to dream land! I got 4 supreme down pillows that are hypoallergenic. It actually has a lifetime guarantee. They are magic, you guys. Honestly, if the basics are good. Life is good. Texture adds flavor to any room! Texture is everything. In decorating, you need a wonderful mixture of textures. Why not do that with your bedding too? This coverlet really makes my heart sing! Gah!! I love it. It is the Hillcrest Matelassé Coverlet and gives all the vintage vibes. Don't you think? I honestly wasn't going for romantic bedding but wow! It turned out that way. Makes me so happy. It looks as cozy as it feels. When you're buying bedding, consider all the comfort possibilities! The Company Store has several comfort guides at the bottom of their website to help you better understand your bedding needs. It helped me a lot. We all need a place we can escape to. I think I need a nap now! May be here for a while. Haha! Of course, you could always add a fun throw too and some throw pillows. But this time around I wanted to share the foundation of bedding and then you can build onto that. Thank you for taking time out of your day to read all about the basics! Let me know if you have any questions or want anymore advice in choosing your bedding. I am happy to help you in the comments section! Big thanks to The Company Store and for making beautiful bedding. Have a beautiful week, friends! Hey loves! How are you? How is life? Life is so good, even though I am still so behind from my allergic reaction. lol. I am looking at the bright side. Coffee in hand and the sun is shining. Today I woke up with a lot on my mind, trying to finish the youtube home tour and decide what editing needs to be done on that piece. I am also working on finishing up taxes so fun! haha! Anyways, lets get to the good GOOD stuff! I am super excited to finally share my favorite store in all of Savannah, Georgia. We actually just got back from Savannah again late Sunday night for a last minute trip to celebrate my boyfriend's birthday! We have spent so much time in Savannah and believe me, I have shopped at so many stores! My favorite store of all time in Savannah is 24E Design Co! I stumbled across this store last year shopping with my brother! There was a hanging swing bed covered in fluffy pillows in the window and it instantly caught my attention. Everything in the store is unique and beautiful. Flash forward to a couple months ago and I actually got the pleasure to meet the owner Ruel Joyner who is one of the most awesome people I think I will ever meet. I went to the front desk this time and said is the owner here by any chance? Then heard a guy sitting at a large medal table made out of AIRPLANE pieces say, "Hey! I am Ruel. I am the owner." He sat there sipping his coffee and was like what's up! I instantly knew we would be friends. He showed us around the store and talked about his story. He comes from a family of designers and has several other creative designers that work for him. They build tables, swings, aviation furniture, sculptures, pretty much anything you can think up- they build/sale and they have so many one of kind pieces and lots of VINTAGE! I posted about this gorgeous light I got from their store a while back! Hopefully you remember that post, if not go back to my instagram and see more pictures later! This chandelier is my absolute favorite! I love it hanging in my bedroom. It is rustic and so beautiful. I have never seen one like it before. It's the Geoffrey Chandelier and you can actually purchase this exact one HERE. Isn't his Ruel's store so beautiful? I literally want everything they have!!! This is one of the most beautiful American flags I have ever seen and it is vintage! It is incredible how he mixes vintage and new so well. I never wanted to leave!! There were giant pieces of airplanes laying around all neatly in the middle that he is going to craft into gorgeous chairs and so many other amazing pieces. He had more chandeliers than I could even count and gorgeous wood floor squares you could buy that piece together so beautifully! "Tradition and travel. Born from the recycled parts of a McDonnell-Douglas DC-9 twin-engine these armchairs are an original 24e DESIGN and the latest addition to our Aviation Collection. Made with aluminum and suede these twin chairs were crafted with precision and detail for a modern day Neil Armstrong. You can purchase them HERE. THEY are fantastic!! I was blown away by how well they Aviation Chairs are made. I would love to have one some day and more rustic pieces in my house. It was wonderful learning about his story and how his family got started! He took over his Father's business. It was truly inspiring. He has worked with so many incredible people and companies. Let me know when you get to see 24E Design Co yourself and tell Ruel I said hey!! I would love to see your pictures too. Big thank you to Jonathan Louis for sponsoring this post and making our sectional dreams come true! Cannot wait to share it all with you! You guys, I am finally back in the land of the living, and feeling well again. So much has happened since we talked last. One really exciting thing that happened is our sectional was delivered and we have been doing the happy dance ever since. Honestly, I take a lot of time choosing what furniture goes into our home and also what would be the best to share with you all as well. We’ve been a Jonathan Louis fan for years now, and thrilled to have another piece in our home. They have so many pieces to choose from, with hundreds of fabrics too. I found the Kelsey sectional and fell in love with it. The shape is really unique and I love the wood grain touches! It frames the bottom perfectly. Honestly, this sectional would go perfect with almost any home. You can mix it up and make it more modern or simply go with my farmhouse sisters and decorate it up vintage style! This is my first ever sectional! We are looking forward to popcorn and movies together on this bad boy. Harper loves it! Can you tell?! Haha! The best part about my sectional ordering experience was that I got to order 3 free swatches sent right to my front door. It was great for planning, plus inspiration! I actually poured some fruit punch on them to test too! It started bringing back science memories in highschool! The fabric I chose was Gypsy Crème and you guys, even though the fabric isn't technically considered "stain-resistant," the juice just beaded right off! Hello world? Are you perfect now? I think so! This makes it super easy to clean and it’s kid/pet friendly! Winning. You kind find swatches HERE. There are SO many! Aside from the beautiful sectionals, Jonathan Louis offers countless collections of sofas, beds, armchairs, other accent chairs, storage benches, cocktail ottomans and much more. They are available at many retailers across the U.S. including Sprintz Furniture in Nashville and Franklin, TN and Knoxville Wholesale Furniture in Knoxville, TN. To all our Connecticut friends there is Jordan's Furniture in New Haven, CT! You can find stores near you by clicking on their “dealer locator” on their site and entering your zip code. Feel free to peruse through my insta to find more pieces we got from @jlfurniture. I highly recommend Jonathan Louis! They are a wonderful company that we believe in. Again, thank you for all the sweet messages and support! We love you all! Hope you also love the sectional as much as we do! Have a beautiful blessed day! I would love to hear your feedback here on the blog or over on instagram as well. I am starting a fitness journey! On Fridays I will be sharing some of my favorite workouts and meals. I would love for us to all be able to support and keep track with each other in the comments section! That way we all can share together. We ALL have different goals!! My weight has fluctuated all my life. I ran track back in the day and have been pretty active. I've always been really muscular. Although, my body changed after having a baby and it was a lot easier to gain weight in my stomach after that. When I gain weight my stomach looks round like I am preggers sometimes so hence the shape. It actually makes me uncomfortable to even look at and show you. It was much straighter a few months ago. I think it's because I had a cesarean and diastasis recti but it can go straight over time with a lot of hard work. I'm 5 feet tall and 132 pounds. The past 2 weeks I have worked out every single day. I am already seeing some changes but mainly, I am gaining a lot of muscle right now. PLUS: I feel amazing and am sleeping through the night. Sleeping so good, that I am actually falling asleep around 9pm (the time I usually try to post on Instagram at night! haha) So that is why I have been MIA lately! Mama needs a nap!! I lost 15 pounds in this picture! I weighed 115. This was taken 8 months ago and then I gained it back after dealing with a break up and just eating my feelings instead of drinking them. It is my fault. I have shaped myself to this point and I take full responsibility! I want to get back to this picture. I felt great!! Honestly, I am not far from my goal but feel like this may help you! Maybe you can relate with me? Maybe this will inspire you to start working out again or just eating healthy?! I know it doesn't matter what the scale says! I am not a nutritionist by any means. My goals are to lose weight and tighten up all over. AKA look and feel good naked. That is the ultimate goal! WE all should love ourselves and feel good in our own skin! I would preferably feel better if I lost some weight :). My goal is 115. Here is the meal plan I'm on right now but tweak it some if I go to a restaurant last minute. Oh, and I started drinking Braggs Apple Cider Vinegar and it really seems to help with cravings and helps me feel better too. It is supposed to help with weight loss, but we will see about that! Also, I switch up my proteins with chicken and sometimes add rice in the evening, change it up with a sweet potato or avocado! Variety is so good! I eat bananas some for snack too and some fruit. I am just trying to keep my sugar intake low right now. then I drink a protein drink after my workout. 3 hours later SNACK TIME yayyy! SNACK TIME: Popcorn or 2 graham crackers, you could always grab more veggies if you are super hungry! I will post some of my favorite workouts next week. For the most part I do 40 min hiit workouts/cardio and then weights for 20 minutes. I do try to mix it up and sit in the sauna! STRETCH before bed! I am always sore now haha!! Okay who is with me?! It is hard but so worth it! I do 1-2 cheat meals a week! Just so you all know, it took me weeks to get enough courage to post this. I have work to do. I want to be honest with you though and show you where I am at right now. This is the beginning. I can also post my workout playlists and some motivational vids I love if you want them too! Love you all bunches! Thank you for stopping by and just being so supportive. I am going to just close my eyes and hit save & publish. Hope this helps you and maybe you can join me!! These are her handmade cards for her sweet friends! She was so excited to hand them out to her friends today. Harper is such a giver! Makes me proud. Harper "bought" me some flowers and pillows at pottery barn! I can't wait to share with y'all all I got! I saved up and bought this headboard at Pottery Barn in December for my birthday and Christmas! I love it! They make it by hand so it took a few weeks to get here. I love the texture and the tufted fabric is beautiful. The nightstands are perfect for this space. I am going to style it more soon. Just wanted to get some pictures out here for you to see. I will add more vintage style books here and some ceramic vases. I got the nightstands from Pottery Barn. I love how much space the drawers have and the shelves are just a bonus. The other side is my side of the bed and I have some of my favorite books stacked up in the corner. I have so many half read books, it's not even funny. I got this bad boy at 24 E Design Co. It's the Geoffrey Chandelier and honestly, I saw it hanging in their shop and it stopped me right in my tracks! I was like, I have to have this!! It's even more gorgeous in person. I love the contrast it adds to the room and the overall rustic aesthetic vibe. I am sharing more about 24 E Design Co. in a few days! I have a lot of pretty pictures I took there in Savannah! You're gonna freak with everything I found there. After I save up enough money, I am going to take the window down here and put french doors in it's place! It will be perfect to walk out on to the porch and get on the swing bed! I also plan on making a corner for my easel outside on the porch to paint there too!! The vase holder and the basket are both part of our collection with Painted Fox! You can get it the vase here and the baskets here! They are both on sale right now! I love how you can change out different flowers and mix it up. The baskets are so pretty and Harper likes to hide my stuff in them. This is my new cozy corner! My brother's friend moved the settee into the living room and then this bad boy right here! I need to get a wider curtain rod and curtains but I love it here. On a sunny day, you can see out on the front porch and all the gorgeous rosebushes. This blanket is my absolute favorite! We both fight over it constantly. I mean, she always wins though. haha! The pillow and purse are part of our Painted Fox Collection too! I got the Sugarboo pillow here and the bag here. I hope you have a beautiful Valentine's Day and rest of the week. Thank you for taking time out of your day to stop by and read about the bedroom makeover and us! Lots of love to you and your family!! 1. I Love You Sugar Boo Pillow. One of our favorite pillows! It's really comfy and durable. We love handmade companies. You have to check out the rest of their pillows too! They make great gifts. These are fabulous. We both have the matching bags and love them! The blush color is even more beautiful in person! 3. Sugarfina Champaign Sugar BEARS. 5. Young Living Aria Diffuser. My friend @jlgarvin with @grapefruitandgold introduced me to this diffuser and it's my favorite. It lights up and has music, which is pretty amazing. I love the design too! Makes for a great gift!! 8. Acqua di Giò Giorgio Armani - FAVORITE cologne EVERRRR! This is a great gift for anyone! THE SNUGGLE IS REAL. It's by my friend @pine.and.birch! You can get several frame options. Gotta love the snuggle. I hope you all loved all the gift ideas! I spent a lot of time picking out my favorites. Have the Happiest Valentine's Day loves! Hey friends! It’s been too long!! 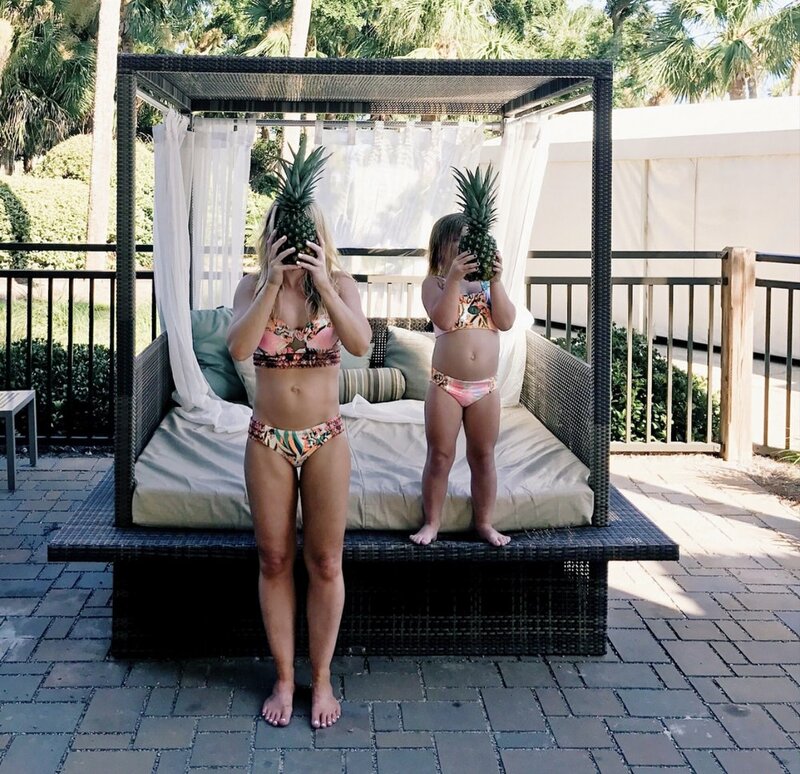 A while back, we went to Hilton Head to see the Festival of Trees at Sonesta Resort Hilton Head Island and it was pretty amazing! I know a lot of you all followed us in our stories and posts and watched our videos but I wanted to share some more pictures here!! It was honestly so much fun. We had never been to Hilton Head in the winter. It is one of the best times to go, especially around Christmas! It’s beautiful and everything is all lit up!! This was our second trip to Sonesta! You an see our first youtube video below! We are doing more videos soon of our house and travel! I am not the best at vlogging (video blog) but I will get better! I promise. I hope you love it. We truly had a blast! You can subscribe to our YouTube HERE! Every day looked like this. And every night looked just like this! All the glow! Our outfits are from Velveteen Clothing! I love their outfits, especially the mommy & me matching outfits!! We pretty much had the entire beach to ourselves, which was really nice. The water was cold but it was still fun and the sun warmed us up! The beach is beautiful and so is the hotel. Luckily, the pool was heated so we got to swim a lot. Harper loved it. Sonesta had it all decorated! It was gorgeous!! She said can we take these home?! haha! I wish! Deep Well Project is amazing. All the proceeds go to help a local family in need. There were a ton of Christmas trees! Each had their own signature design and theme. They were all special and unique. I was like a kid in a candy store because Christmas is my favorite! Harper loved it as much as me!! We would go to the lobby during the day and night to look at all of them. The white train tree and troll trees were her favorite! I love to give back and see companies give back as well. I couldn't help but think all the families and schools they were helping out. It is so giving of Sonesta. I thought about all the happy faces on Christmas morning, all because the hotel and such a giving community. Hilton Head is such a tight knit community and it's really lovely to see!! The hotel looked amazing with all the trees wrapped in Christmas lights. Harper loved it so much!! Blurry but a goody! She will always be my little girl. I love her so much! Y'all, we brunched it up! Every day is brunch day! The hotel has the best food! I am serious. I know you don't hear that much. Everything tasted different and so good! Nothing tasted the same. I love some food. H loved making her own waffles every morning. They have an awesome omelette stand where you can create your own! We got a little bit of everything! We ate at Heyword's Restaurant for brunch, it's inside the hotel. One day Harper was playing with her plate while I was packing on the eggs in the brunch line and I told her to be careful. She kept playing and sure enough it broke into so many pieces! I was embarrassed. One of the employees came over and instantly gave Harper a hug and another plate. Then two other waitresses came over and cleaned it up quickly before I could even get all the pieces picked up and told her it was ok. It really meant a lot to us! The staff were super considerate and made sure to make Harper feel special. They have a great staff and go above and beyond. They even text you to rate your stay and ask if you need anything. It is really thoughtful. And since we are talking about food, here's a few of our favorite restaurants outside of the hotel! THE SALTY DOG CAFE // Snow Crab Leg Dinner is amaze! We also took a quick trip to Savannah for the day! It isn't very far from the hotel. We loved the shops, carriage ride and restaurants. I will post more on my next blog post because I actually went back to Savannah after this trip! I have all kinds of good stuff to share! Savannah's Candy Kitchen was everything! We wanted everything! haha! We talked Uncle Sam into going in with us. He is such a good sport! I love my ESCAPE bag! It is the best bag to travel with and beautifully designed. You can get it here. There are so many beautiful and fun spots in Sonesta! I mean, can I just take this gorgeous couch with me?! Ah! Love! Okay, I know it's blurry but it is still beautiful! You get all the glimmery vibes even outside the hotel. Happy dance!! We will definitely be back to Hilton Head again soon! Thank you for stopping by friends! 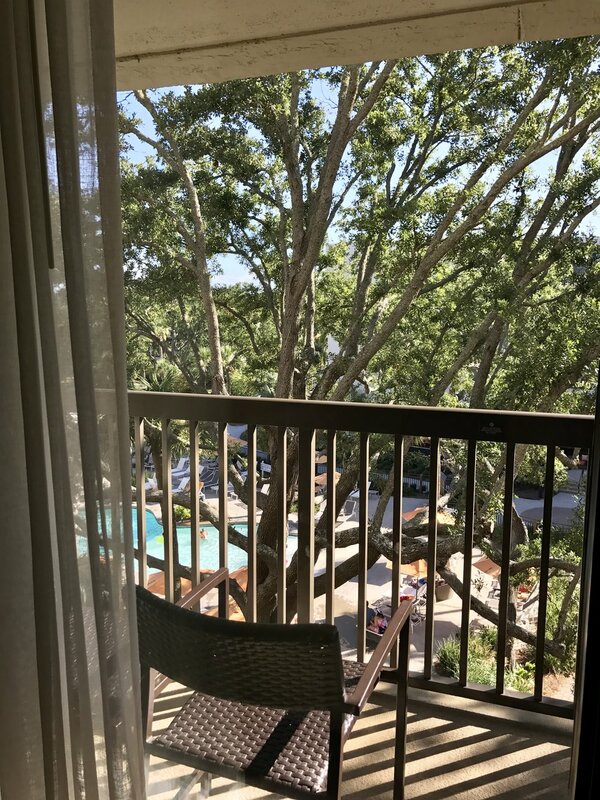 Make sure to comment your favorite place in Hilton Head or around the area, so we can check it out next time! Big hugs! Love you all! BIG thank you to Sonesta Resort Hilton Head Island for inviting us to the Festival of Trees! Hope you all get to see it next year!! We are excited to be sharing a post with Crate & Barrel SUNDAY (we changed the date):)! It’s going to be fun! We wanted to give a quick sneak peek before it goes live! Fall is one of our favorite seasons because it’s about being together and cooking with each other! It’s about having friends over and entertaining! Without giving too much away, we are making one of our favorite fall dishes and can’t wait for you to see more! Head on over to Crate & Barrel’s blog Sunday to read more! Big thanks to Emily Anne Rich for taking all the beautiful pictures! I can’t wait for you to see the rest! Have an amazing night! Pumpkins, Meeting Sadie & Letting your light SHINE. Pumpkins. Meeting Sadie & Letting your light SHINE. After Several weeks of calling pumpkin patches and all the regular pumpkin places, we finally found someone that had some! Whew! We jumped on it as quick as we could too. One of our friends on facebook told us we could come to his hardware store and get some. He had literally just got a shipment in from one of the local farmers. We were super excited and rolled up in there on a mission. They took us to a back room and then out to their extra store. This is straight VIP pumpkin status y'all! hahaha! I would of taken the entire box if I could. The green and white ones were my favorite. We got a ton of pumpkins and had the best time just being with each other! It doesn't take much for us to have a good time. This sweet thing batted her eyes at the hardware employees and next thing you know they were giving her all kinds of tootsie rolls and then popcorn. She has this talent. She will find food no matter where it is! Another crazy thing is... we will be at a random store or restaurant and people come up and say here, you are a cutie! Have a dollar! I wish people would walk up to me and hand me money! hahah! No joke! She has probably made $30 just in being cute! She has got it made and doesn't even know it! I am thankful that even though she is a straight up diva, she is still very thankful and appreciative. She gives her dollars away to random people too. She pays it forward and it's super sweet. Okay, back to pumpkins! haha! We were really happy with our pumpkin haul and can't wait to get more. I stuffed them in our newly painted fireplace and mixed them with our "new" vintage books we got at our favorite antique store down the street. That store is our favorite but dang, we have to almost wear a mask in there because they stain a lot of their furniture and it stinks to high heaven. I kinda feel like I burn all my nose hairs when I leave so I don't take Harper often! We run in and out! She gets shipments in from London so we can usually find some pretty neat stuff. If you follow our insta stories you know all the crazy stuff we came across too! Hello creepy clown doll. For everyone asking, these signs are really awesome and no, I am not just saying that. I am only going to share with you things I love and these are definitely amazing! I collaborated with Laney at @pine.and.birch and they are exclusively at @paintedfoxhome. You can find them in our home line here. They are on sale right now too. The day we met Sadie Mae. I have been on a puppy hunt for several months now. Harper wanted a puppy or a baby sister for her birthday, so puppy it is! No joke! She has been begging for a sister like crazy too. It would definitely be divine intervention right now and there is no way she gets a baby for her bday! We went to shelters and searched online. Harper finally picked out a few types of dogs she liked. It was a lab, a golden retriever, a minature dog or labradoodle. I searched high and low. One of our sweet friends found a picture of Sadie and it said looking for a loving home! I was like OH MY GOSH! Harper will freak out. She just had the sweetest eyes. I thought about it for a while and finally messaged them and we loaded up the car, with no leash at all mind you and were hoping to fall in love with our new addition. There was a lot of crazy exciting emotions and singing going on in that car! We made it and Sadie was much bigger than the picture we saw. I said, "wow, I didn't know she was 9 months!" They told me she was 9 weeks! That's right, yall! Our little Sadie, is gonna be a giant Sadie! We fell in love with her and had to take her home that night. I had no idea what i was doing. Literally, rushed to the pet store nearby and handed them my card. She set us up with food, crate and toys! We raced back home and I carried in the heaviest crate by myself. It took over an hour to get that dang thing to pop open. It was a wild night but we were so happy to have Sadie with us. We wanted a loving family dog and also a guard dog. It gets scary out here sometimes and I think she will be all that and more. NOW, that being said, this has been one of the happiest times of mine and Harper's lives but also a hard time as well. I have had some really bad comments sent to me, one of which pretty much bashed me for anything and everything I was doing wrong, including judging my faith, life as a single mom and puppy decisions. I will not make much light of the horrible things they said or the few other awful messages because that will just shed more light on their hate. It really shook me to my core. Normally, I do not let things bother me like that but you guys, it was bad. It really bothered me. Those words made me question my life. It is hard y'all. I try to be open and honest with you all as much as possible. I shouldn't have to validate myself here but I am a single mother. I wake up in the morning just like anyone else and pray and hope for the best. It is a struggle sometimes. There is a lot of work involved, working two jobs and also being a mama. I am doing the best I can just like anyone else. We are all struggling and trying to do the best for our family and ourselves. I would never want any of you to think I live this fake bright and shiny life all the time. I choose to be positive and change my perspective daily. Making people happy and inspiring others is everything to me. Sharing things that are beautiful makes my heart happy. I want you guys to embrace the beautiful parts of life and try your hardest to stay positive through the hard times. Sometimes in life we run into adversity. It may come from events or other people, nevertheless we have to strive to be the best person we can be. We NEVER blow someone else's candle out to make our selves shine brighter. We don't point out (our perception) flaws of other people because to someone else that might be the most beautiful thing about them. I have struggled over the past few days with the way some of my followers have voiced their dislike and disapproval of me and my choices. I have contemplated over that for a few days now. It has been really hard. I have decided that I AM PROUD of what I have done from every mistake to every failure because i have the ability to humble myself in learning from them. 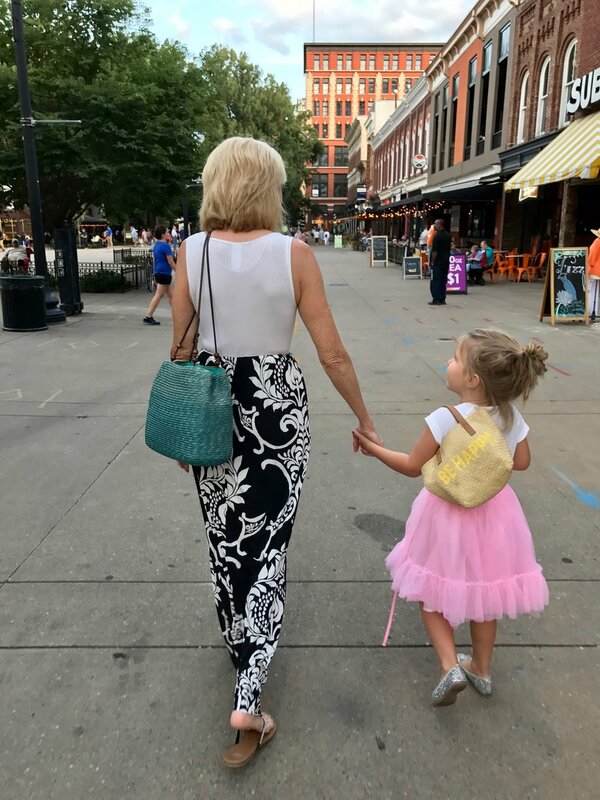 I have also seen the look in my daughters eyes and witnessed her kindness toward others and decided that I will not allow bitterness in myself to tarnish that in her. So please be kind to one another. Tell someone they look beautiful today. Ask someone a random question that you know they know the answer, to lift them up because we are only able to control our actions and reactions. I will not let someone judge me and tear me apart. I have worked too hard to let someone try to take it away just because they don't like my choices. Let your light shine! Be the light. People will try to tear you down but push through anyways. People will try to be mean but be nice anyways. People will try to use you but love them anyways. You are beautiful. You are brave and smart. It doesn't matter what people say about me because I love myself and I am going to continue to let my light shine. NO bully or anyone for that matter can stand in your way. You are meant to be something amazing. Let that fire in you continue to burn. Be creative. Think outside the box. Do the impossible but don't ever let someone tear you down. You may get sad, cry. You may fall down. Pick yourself back up and continue to follow your dreams. In the face of adversity, continue to shine. Sending you all our love! Thank you everyone that watched our ig stories and sent an outpouring of messages. They were beautiful and I cried my eyes out reading them. The good outweighs the bad. I am thankful for my faith. I am thankful for you all. A few simple changes can make a huge impact. I've been dreaming of freshening up the kitchen for a while now. I fell in love with my kitchen at first sight. I love the galley style kitchen and open shelving that originally came with the house when I bought it. The previous owners did a fantastic job designing it and the pinewood floors are everything! No farmhouse is complete without a large farmhouse sink! I wanted to freshen up the walls and make it bright in here because there isn't a lot of natural light, other than the two windows and then side door window. I also wanted to lower the shelves some and make them more user friendly! Although beautiful, shelves I had were not wide or thick enough. I went through some gorgeous paint colors from Pottery Barn and decided on the brightest clean color, Sherwin Williams Extra White. Sometimes it is hard to purchase paint online but I recommend zooming in on the color with your phone and holding it up to your wall like a swatch on the spot! It did match perfectly. The color was super clean and turned out better than I even imagined. Luckily, I had help from my friend Charlie Bryant with Bryant Construction! They helped paint and hang the floating shelves. We actually hung them together and they were very easy. The shelves are even more beautiful in person! I mean, I knew they had texture but goodness, there is all kinds of juicy texture and different colored browns all wrapped into one. I like the chunky look and felt the length was perfect for my kitchen. I also think they would look pretty lined up from top to bottom on a wall in a dining room! The shelves are from Pottery Barn as well and super affordable. I got them here. The biggest thing I recommend is to have help hanging the shelves because they are a little heavy and you wouldn't want to risk dropping them and scratching your walls! Once you screw the long bracket in, you lift the shelf up and push it down flush to the wall and it clasps from there. Pretty genius! I have tested out the durability and it is super durable! I am talking these dishes are really heavy and it didn't even budge! This part is my favorite. Think first, what do you want most from your kitchen? For me, I want to be able to utilize this space as much as possible! I used the long shelving so I can stack different plates, cups, plants, and almost anything else i can imagine! I want to have a nice space for my coffee area and then another for my go to dishes above the oven. After styling them, I started decorating the left over space on the shelves and build from there! The best way to get a fresh look is to add rustic vases like these and then fill them with your favorite flowers. I love all the different vase heights. It just flows effortlessly through the room. I plan on using them all the all year round. The cutting boards are great to add throughout so you can use them quickly for all your yummy recipes. These trays are awesome! They add height like the vases and you can put hand soap on them, all the way to candles. I placed the napkins on the shelves and left some out on the counter too. They are super durable and I use them for more than just napkins. I have used them to dry dishes with too and they work great. They are pretty even just stacked on your shelf. I am so happy with how everything turned out. The color turned out perfectly and the shelves are fabulous! This proves that paint and some lovely shelves can truly transform any room! It is a lot brighter in here now! We painted the cabinets with the same paint on the walls. This made the countertop really pop! I have already spilled spaghetti on one of the cabinets and didn't know until the next day. It freaked me out. I used soap and water and it came off instantly! Yass! Let me know if you have any questions. I hope you all love everything. It's been hard keeping it quiet this long! This blog post does contain some affiliate links. Thank you so much for checking out our mini kitchen remodel! Hope you loved it!! Have an amazing day!! Ps Big thanks to Pottery Barn for helping make this happen! Big thanks to Sherwin Williams too! We can't wait to share recipes and so many more pictures of memories we create in here with you!! I am still pinching myself over this crazy amazing experience. This is the first HGTV home I have been in and it was unreal! Meeting the HGTV crew & Brian Patrick Flynn was icing on the cake. A few years ago, if someone told me this would happen, I would of never believed them. But it happened! I am honored HGTV invited me and can't wait to show you the inside! 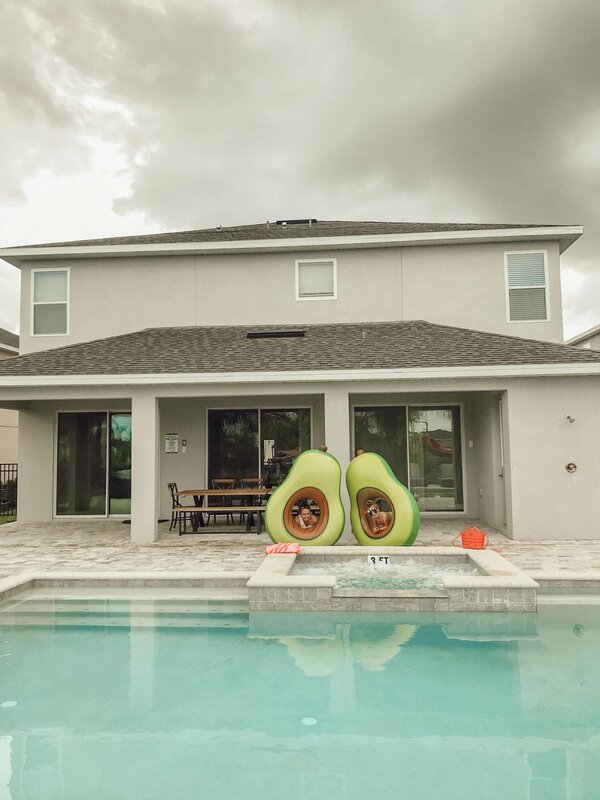 The best part is that anyone could win this gorgeous home! You can apply to win twice a day! This gorgeous craftsman cottage is located in the 4th and Gill area of downtown Knoxville, TN! Scripps Headquarters is also located in Knoxville! I am a little biased because I went to UT but go VOLS!! I love it here! Check out these few before pictures! Sherwin Williams Sea Serpent and the INFAMOUS pink door is Sherwin Williams Hopeful. The trim is Sherwin Williams Incredible White. Almost everything furnished in the home is by Overstock.com. The pink door is a millennial pink! Brian talked about how he looks at the most pinned pins on Pinterest and what the most popular trends are! He wanted the house to stand out! I think the contrast is fabulous! I want a pink door now!! We should all get pink doors ;)! 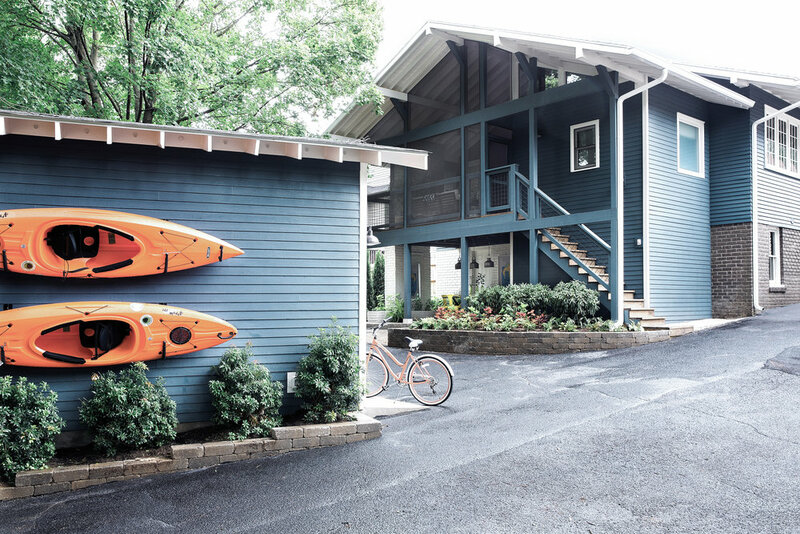 With art direction and décor from Atlanta-based interior designer Brian Patrick Flynn, the approximately 1,850-square-foot Craftsman home features three bedrooms and two bathrooms centered around an open and airy living concept. 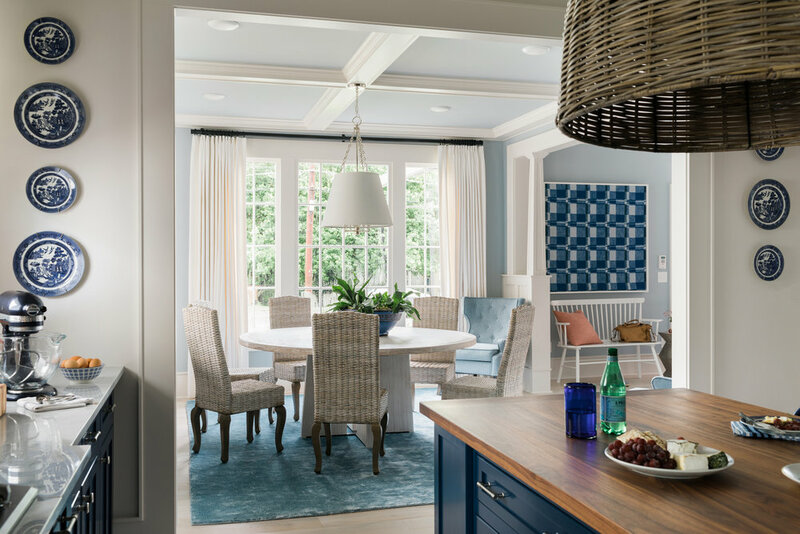 HGTV Urban Oasis 2017 Project Manager Scott Branscom oversaw the renovation process, which required turning a duplex with separate living spaces into a single-family home. This home was designed & renovated by architects Open Door Architecture and Tillman Companies and the feel of the home is best described as casual modernist with artistic style, and the clever use of space makes it exceptionally practical for the modern-day family. During the sweepstakes entry period, which runs from October 2 through November 22, eligible viewers can enter twice per day online at HGTV.com/UrbanOasis for a chance to win the giveaway. The HGTV Urban Oasis 2017 grand prize winner will receive the completely remodeled and furnished home plus $50,000 provided by national mortgage lender Quicken Loans®. HGTV Facebook, Instagram and Twitter fans can check in for ongoing updates and new details (#‎HGTVUrbanOasis). The HGTV Urban Oasis 2017 sponsors include Overstock.com, Inc. (NASDAQ: OSTK); Quicken Loans®; Kohler Co.; Samsung Electronics America, Inc.; SimpliSafe Home Security; American Institute of Architects; and Bush Brothers & Company. Cue take my breath awayyyy by Berlin!! This front porch is everything! I love the open floor plan and the overall fill of the living room. I love the mix of classic and modern! Bryan talked about how much he dislikes the television hanging in the living room because it takes away from the overall aesthetic. He also wants it to be an open space where guests can just chat and spend time together. The beautiful abstract painting by Sally King Benedict is perfectly placed when you walk into this cozy space! Hello gorgeous master bedroom! I never would of thought to use blush curtains! The curtains and closet really make the room. When you look inside the closet, you'll find wall to wall custom floral wallpaper! I hope you got to see it on the live video. He picked out beautiful accents that just flowed together, some new pieces and some antique. Brian made sure to add all different elements and even added a pair of vintage gloves to give off an Audrey Hepburn vibe!! I like to call this a honeycomb wall and it's fantastic! They made sure to tile it all the way to the ceiling. I love how open it is. There are windows added at the top for extra lighting. Brian said if you are going to use bold wallpaper or bold colors put it in a smaller room you don't spend a lot of time in for the most impact. Genius!! This custom wallpaper is so feminine and yet the tile brings a masculine side out as well. It is a healthy balance where anyone could live here and just be happy as can be. I don't think I would ever leave the tub!! You can tell there was a lot of thought put into this entire house, every single detail was well thought out. Paint Colors: Benjamin Moore - cabinets Van Deusen Blue, Behr - ceiling Frost, trim color match to wall tile. This kitchen is what dreams are made of! Those chandeliers alone were just phenomenal! Bananas! He left the exposed brick as a focal point and painted it a nice whitewash. The baskets add some beautiful texture and highlight that accent brick wall. 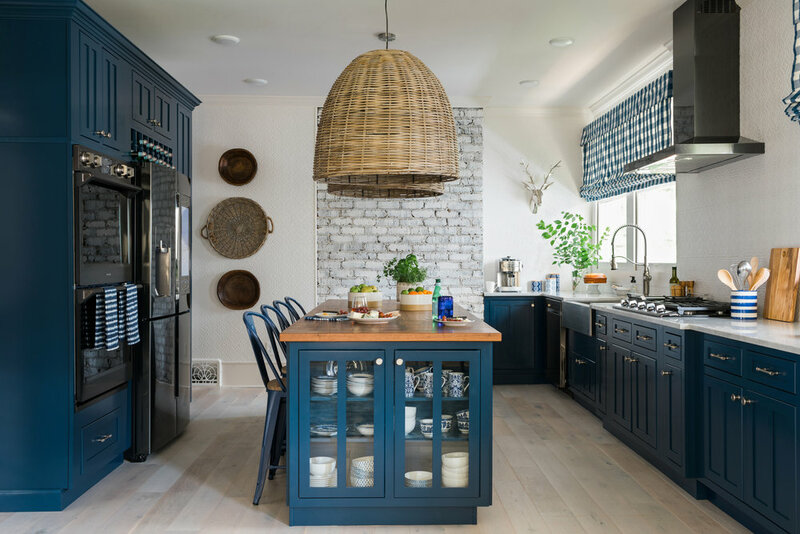 I would never think of going this blue in the kitchen but after seeing it, it's a total game changer! The blue is beautiful and timeless. I could see it in a farmhouse too! See the small vintage plates on the sides? Yes, he thought of everything!! Paint Colors: walls Swanky Gray, trim Incredible White. Brian talked about how he chose a round table so you could pull extra chairs around it for added seating if needed. That is such a smart idea. The blue chairs were so beautiful! See how the blue flows throughout?! The open hallway is lovely. I love how the bench sits perfectly at the end! It's so airy and free. All that white! 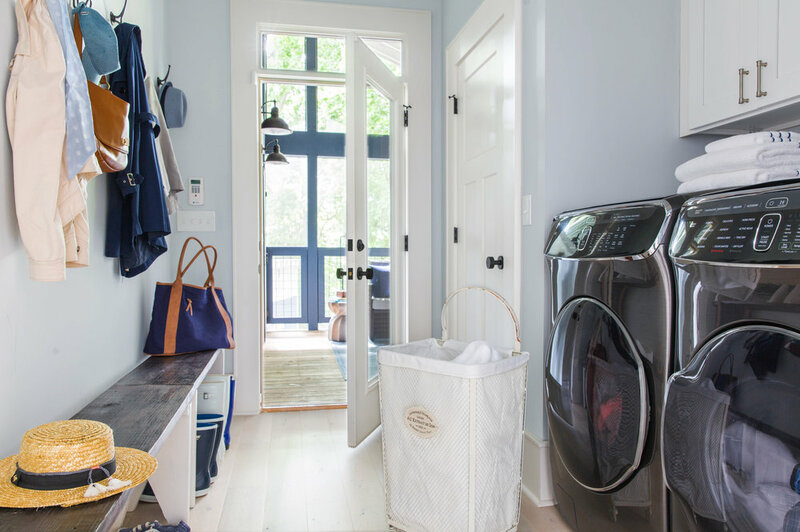 The walkthrough laundry room is such a nice touch. Paint Colors: Sherwin Williams - trim and doors Grey Matters, walls, ceiling and closet interior Passive. The guest room is super inviting. He framed a duvet that was too small for this bed on the wall to the left! How awesome is that?! Such a great idea!! OKAYYY this bathroom is amazing! Do you all see over to the right? That is a sliding "barn door" shower and it is gold!! I went to the bathroom and may have slid it back and forth a few times hoping I wouldn't get caught! Haha! This second guest room is just perfect for an office and extra space for guests. I love the built in bunk beds! This house had an apartment on the back which is now this gorgeous screened in porch! The furniture he chose is such a great mix and he hung a flat screen tv to the right. The natural elements of the table and wood furnishings and trees are my favorite. That landscaping though! These hanging orange kayaks really bring a beautiful contrast! Look how big the house looks from the back! If you look close you can see the hanging pendants at the bottom over the outdoor dining table. The garage was insane! I love this extra living room. Imagine all the parties you can have out here! The gallery wall wrapped around the entire space! This really happened!! Brian is such an awesome person and designer!! I learned so much from him. It was such a great experience that I will never forget it! I was major fangirling at this moment! Lord have mercy! The garage door is stunning and look at the lights! Literally swooning with this fabulous table and metal chairs!! 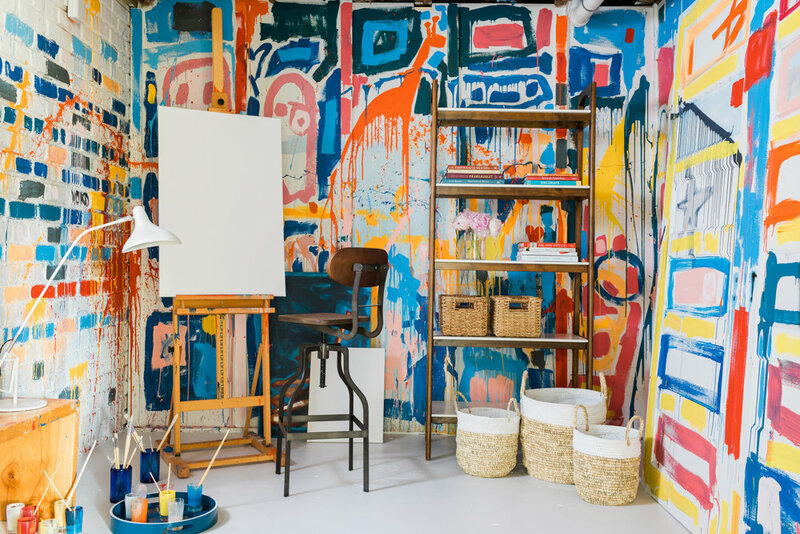 If you love color, this art studio is perfect for you! What a creative oasis!! added art studio connected to the garage is a nice touch and super creative space. Whoever wins this house is just gonna love it! We ended the night spending it with Rhoda! Her blog is Southern Hospitality! She is a super talented blogger and decorator! We first met at the Haven Conference and I am so glad she came to the HGTV Reveal! We ate at Tupelo Honey in Market Square and just chatted about life. Make sure you check out her blog and instagram! Honestly, this was such an incredible experience. I will never forget it. Big thanks to Brian Patrick Flynn , HGTV and everyone that made this happen! Thank you for inviting me!! It's an honor. Talk to you all soon and sharing our kitchen reveal next so stay tuned! !